Still exhausted from the cycle, and suffering once more from my recurring illness, we seperated and wandered aimlessly through the city. To wander the ancient streets around the Jokhang is to travel back to medieavel times. Dusty weather beaten peasants walk clcokwise around the temple alongside crimson robed monks, while butch looking khampas from the east huddle in groups beside market stalls. Incense burns, and prayer flags flap above the houses in the wind. Outside the temple doors pilgrims prostrate themselves to the sounds of mournful chants which fill the arid air. 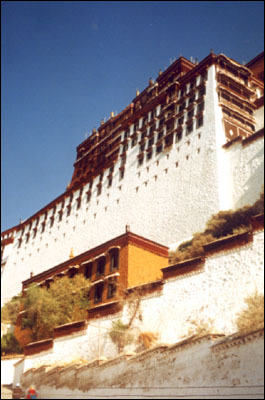 Inside the Potala, the seat of the Dalai Lama since XXXX, more tourists clambered to get a view of the different thrones. "Getta load a this Noreen..." shouted one camera laden tourist through the echoey corridors, "this is where the Dalai Lama slept." His southern accent cut accross my mind like a cheese grater. I wanted out, and I wanted no part of this. Tourism had become a farce, a quick way to earn a fast buck. What the hell are old people from Alabama doing wandering around a palace in Tibet? I escaped outside and contemplated Lhasa from one of the ramparts of the palace. The dry hills in the distance felt lifeless and hostile, yet I could not help but wonder about the developments that had unfolded beneath their bare escarpments. I stood alone, thinking about the history of this sad little state perched on top of the world. But, while I came looking for adventure, mountains and exotic people, perhaps the most important thing I had yet to find was myself. Standing tall with a visa card in my pocket, a flight ticket in my bag, and the world at my feet, I come to realize that I am a part of the same world as the tourists back inside. We watch on and marvel at what is around us. We can touch, we can feel, we can have respect and awe, but we can never be. There is a new future coming for the human race. For many it has already arrived. I cannot deny my part as a representitive of this new world order, and there can be no turning back. We are entering an age of money and freedom, a life of comfort and security, a destiny of unlimited potential. This change is passing over the us imperceptibly. Mankind strives forward faster and faster, producing more cars, and building newer and bigger supermarkets in remote corners of the world. But few ever stop to consider where we are going and why. Before long,the lifestyles of the herdsmen on the high mountains will soon disappear as more people and more cars race on towards an inescapable destiny. Within a year the road to Ba-yi will be paved, and within a couple more the road may well extend all the way to China proper. More trucks will come bearing fresh fruit and goods, and people will follow. Tourists will come, and money will follow. And like the rest of the world Tibet will gently slide into the 21st century as just another little town in an ocean of globalization. This future marches towards us like the rising of the tide. It is unstoppable, and as it washes over it us, it will change us forever. I cannot fight this, but for the first time I mourn at the passing of an innocence that we once had. Now I retutn to be part of this race to the future, to join the raging masses in our quest for development. - I do not see it as a wrong or a right, a black or a white, but I do now see it.